The First birthday, The BIG 1 of your bub’s first life, is undoubtedly the most special events of your life. In most cultures, cities, and families, the first birthday is of much essence. It is also the most awaited time for parents – their little munchkin is finally reaching a big number! Everyone wants their baby’s first birthday to be the most special but they tend to make some common mistakes only to regret later. 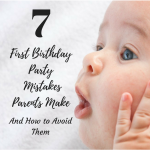 Here I have a quick checklist of the 7 first birthday party mistakes parents make, and how to avoid them. Birthday Cake Calculation is one of the most common first birthday party mistakes parents make. It is indeed one of the most aspects of a birthday party. Kids, grown-ups, friends relatives, everyone is keen to know what’s in store. In about a kilo of birthday cake, 20-30 people can be served, depending on the size of the portion you want to serve. Let this calculation be your guide for ordering a birthday cake. Also, go with a tried and tested baker, and a tried and tested flavor. You don’t need any surprises of unpleasantries on your special day. Also, a little extra cake won’t harm, so keep your margins. Deciding on a theme well in advance can always help you source items accordingly. If you want one of the common themes, for example, a mickey mouse theme, their supplies are easily available everywhere. If you are thinking of an unusual birthday party theme, say like pirates, you may have to keep some time handy to source your supplies. Short term or sudden plan of a theme can be a mistake for your child’s first birthday party. Yeah, I agree. you really want to invite the whole town and the entire lineage! But remember that the birthday celebration is going to be very stressful for you as you are going to be the grand hosts. And also, the grand hosts have a little baby who is probably not going to be very crowd friendly. So inviting way too many people could be a first birthday party mistake. Keep the first birthday limited with guests. Invite people who are close and important (or the ones who would brood if not invited). Maybe a couple of years down the line you can think of a bigger party. But for the first birthday party, keep it in a closed circle so it is fairly convenient for you to manage the party, your kid and the guests. One of the biggest first birthday party mistakes parents commit is skipping on the naps of their baby as they are occupied with preparations for the evening. It will eventually make your day difficult because even before the baby is ready to cut the cake in the evening, the new, fancy dress and the crowd, the lights and the music are going to exhaust the baby in advance. If they have skipped their naps as well, then its a direct invitation to cranky moods and crying spells. Plan the timing of the birthday party around your baby’s routines of sleeping. Since most parties begin with a little chit-chat while everyone arrives, followed by cake cutting and a meal, ensure that cake cutting timing is at least an hour or two before your child’s nap time or bedtime. The baby can participate in cake cutting and when everyone proceeds for their meal, you can manage the baby and gradually help them take a nap. You can also simply sit at a spot and hold them, while everyone is busy with the feast. Planning fun activities and games for the event is good unless you have really small kids coming to the party. Planning activities is a good idea, if most kids are 3-4 years or older. If most of the kids fall below this age category, it is best to just proceed with a simple cake cutting followed by a meal. The kids would anyways not remember much, so make the party a memorable one by spending one on one time with guests instead of engaging them in tedious or consuming activities. Nevertheless, considering to give the DJ a miss is one first birthday party mistakes you can avoid. The birthday child is probably going to be affected by the loud music and flashy lights. You may seek an arrangement for playing some music casually at a certain point in the party so that some friends and enthusiastic guests could shake a leg and celebrate the grand event. It is good to plan a guest list way in advance. It is an even better idea to let people informally know a tentative plan in advance. Share with them about the date and time, and that you are planning a birthday. This can let people know that a formal invitation may come later, but they know the details of the event. They can well plan the day in advance and you can have the maximum people attending. The basic rule of thumb from my personal experience is that if you invite a 100 people, 85 will confirm. And if 85 confirm, about 70-78 will turn up. So some bit of ‘no show’ even from the confirmed list should be expected. Inviting a 100 and making arrangements for more than the number of invitees can become one of your first birthday party mistakes. This is by far, one of the most hectic and the most demanding tasks of your child’s birthday party. It is only when you start to look out for your child’s birthday party venues, you realize that you don’t know enough fun places. It is extremely tedious and tiring to seek locations to fit the group of people you expect to visit you. Finding a place that is pretty enough, reasonable enough, offers decent quality food and is in the budget, is utter chaos. Finding one place that fits the bill is going to be a nightmare come true. Often parents personally visit each venue, which takes a lot of time before you zero down one place. Arguing with vendors for rate, finding suitable decor or even seeking a decent comparison of the services can all become a challenge. And giving your time to seek the information can be another in the list of first birthday party mistakes. The first birthday of our twins was full of these first birthday party mistakes too. But the fourth birthday of our twinadoes is going to be a lot more sorted!! VenueMonk is a website that helps you solve party hassles in a matter of minutes. Covering the Delhi, Noida & Gurgaon areas they make venue searches as easy and convenient as it can get. Whether you are planning your baby’s first birthday, the fourth or the fortieth; your anniversary, kitty parties, or even an office party or a conference – if you have an event coming up, VenueMonk can help you locate the perfect venue for your event. They even help in managing end to end events for marriage and reception functions in the NCR! VenueMonk helps to search party & conference venues within your vicinity. The venue: You can see snippets of the venue, the arrangements, saving you the effort to manually go to the location and see it. Rates – Rates are available in per person and other such packages. VenueMonk can help you identify the best of rates available for a certain venue. So you can well check what fits in to your budget and what facilities would be available at those rates, without the chik-chik & jhik-jhik of bargaining. Themes: VenueMonk has preset themes for your party. So no running after supplies or even wrecking your head for deciding the ‘what’ and ‘where’ of a theme party.From over 30 themes to choose from, the only difficulty you could have is to choose one from these themes. Casino theme, Bollywood theme, Masquerade theme, Madagascar theme, prince themes… take a look and you’ll know what I mean. Your Party, your venue, your choice: A rooftop location, or a poolside venue. A closed banquet hall or a small hall for a party of 30 guests – you get to choose from several options that VenueMonk has to offer and feel in total control of your celebration. With VenueMonk by your side, you are likely to make lesser first birthday party mistakes, which means a more successful and enjoyable party. If you liked reading this article, DO SHARE IT with your friends & Family. I just love the tips you have shared. My daughters’ birthday is just around the corner and can’t thank you enough for sharing about venue monk. These are some really great tips to be kept in mind..thanks for sharing..! The tips which you are share really awesome..
Good tips dear! I totally agree on all these points. The bundle of joy for whom we take all efforts to celebrate , gets ignored and deteriorates his/her health. Wonderful write up dear. Really very useful for not throwing only birthday parties but for any party. These tips are helpful for many . Thanks for sharing. Kids’ first birthdays usually are celebrated by everyone except them. These are some great tips to help them enjoy their day too. Really amazing tips for parents to be kept in mind while organizing the first bday party! Awesome tips for new mom and dad. Thanks for this post.